Architectural design plans for office spaces have undergone a sea change in the last few decades. Brands and companies have realised that the primary purpose of a good office design is to foster greater productivity instead of enforcing discipline. 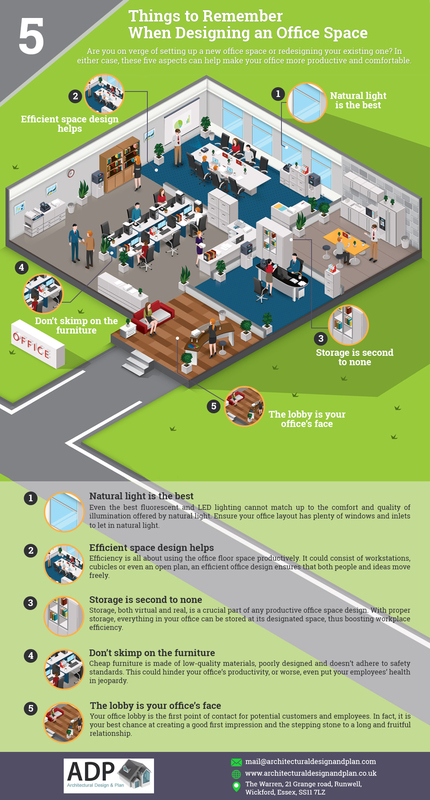 If you are about to create a new office space or redesign your existing one, do refer to these five tips. The best office design ideas have ample natural light among their main attributes, and appropriately so. Human beings have a natural affinity to sunlight. In fact, natural light is known to have a psychologically positive impact, which is what creating a productive workspace is all about. Space planning in office also refers to using space efficiently and designing enough storage space. By using space efficiently, you make the most of workspace design psychology and encourage the free movement of both people and ideas. Good quality furniture is another one of those office space planning concepts that most owners and managers tend to overlook. To draw an appropriate analogy, the furniture is your office’s infrastructure. And it goes without saying that productivity increases with better infrastructure. As such, it makes no sense to deprive your employees of quality infrastructure when planning your office space. Which brings us to another oft-ignored aspect of office design. One of the common aspects among different types of office layouts is the lobby or reception area. The lobby is the first point of interaction for people who step into your office; it can be a prospective client or even an employee. That is why the best office layout design is one that has a reception area which is reflective of your brand’s values and philosophy. Good interior and architectural design are all about making the optimum use of your office space. At Architectural Design & Plan, that is the motto we’ve followed with every office design project that we’ve worked on. We employ the finest interior and architectural designers in Essex and offer competitively priced office design and office space planning services.